This product requires the base game Men of War: Assault Squad. 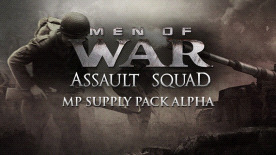 MP Supply Pack Alpha is the first official DLC for Men of War: Assault Squad and features 5 new competitive multiplayer maps for various numbers of players. Each map has its own unique setting and battle landscape. The 5 new multiplayer maps are for the gamemodes Assault Zones and Combat.